The Ventury Celery has sprouted! I’m quite impressed. 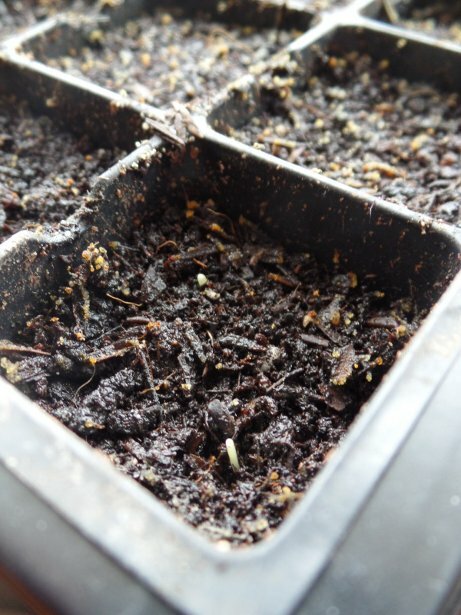 A total of 16 Ventura celery seeds were planted from seed that was from 2010 – seven years old. About 13 of those germinated! They are INCREDIBLY small still, but it took about seven days to germinate. You can see a slight green spot in the second-from-bottom planter and two small green spots in the bottom planter. I am writing this entry two days after I took the pictures – and when I checked the morning, some have the first two small seedling leaves showing up and are easier to see. Probably will have pictures next week. For the onions – what a difference the fan has made. Running the fan while the lights are on has kept the top of the soil mostly dry. That is great and so far, it has prevented damping off fungus from growing. You can see the older Walla Walla onions in the background – and in the front are the newly germinated Walla Walla onions. Again, these pictures are a couple of days old now – and every single cell (from memory anyways!) has at least one seedling – and many have two. More great germination on this second batch of onions. Some good progress so far. 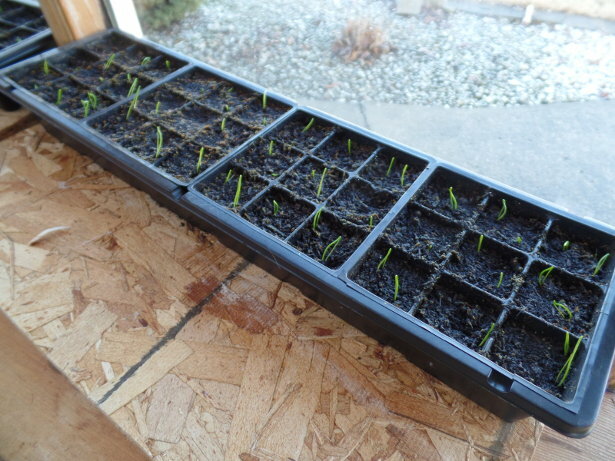 Just hope that the new onion seedlings all do well. If they do, I am not sure where I’ll be planting all of them! 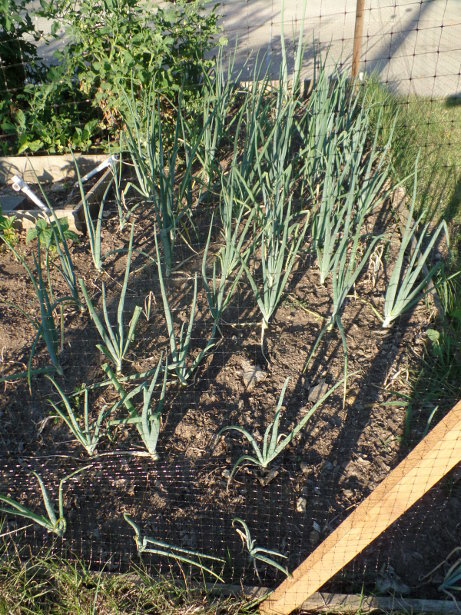 There will be approximately 144 new onions (that is, if there is 100% germination) plus around 30 older onions. 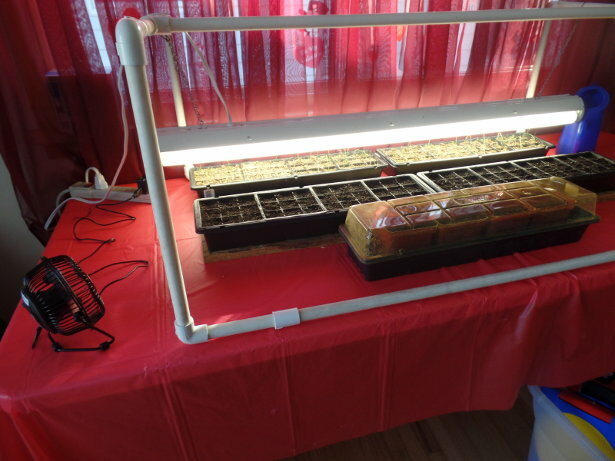 Problem is – I’m already using a good chunk of space under the germination station. 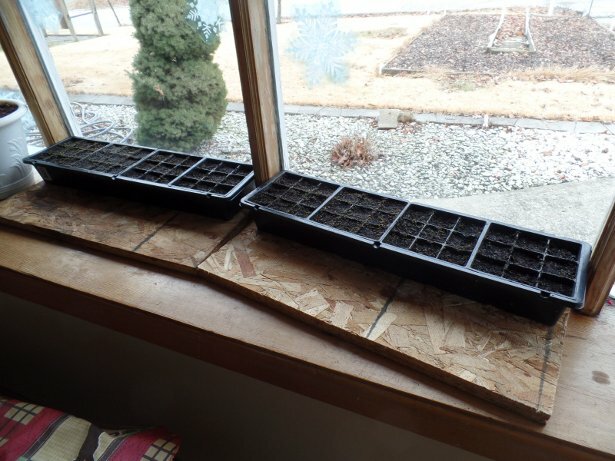 I’ve planted twice as many onions as I typically do, so a full row under the germination station is being used – that would otherwise be used to start the tomatoes, peppers, and lettuce. 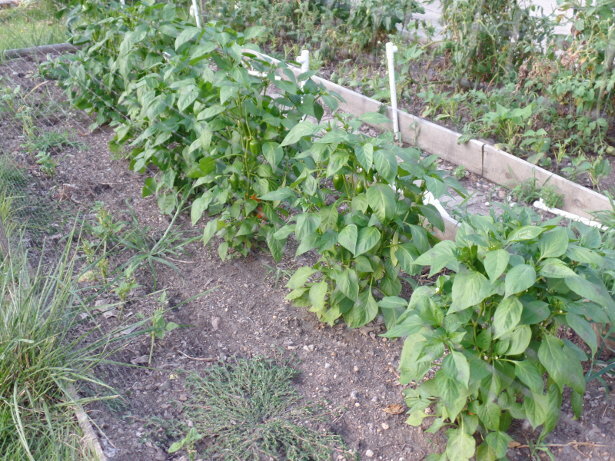 I have not fully decided yet – but I may not plant peppers this year. Or if I do, maybe only half as many. We have at least two full gallon-sized bags of chopped peppers in the freezer still. They don’t seem to get used nearly as quick as others. 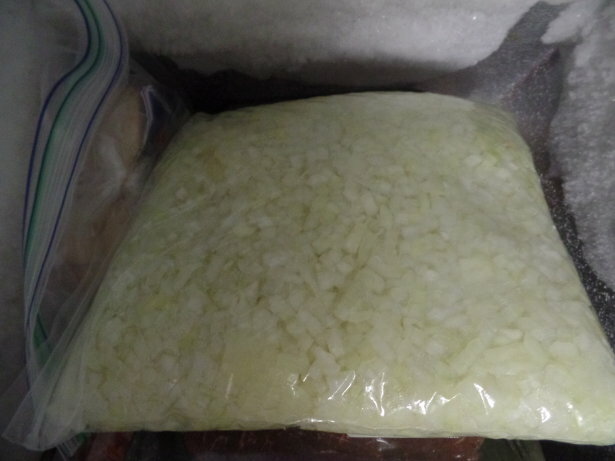 Heck, we still have about a half a bag of chopped up onions too. The Walla Walla onions have not done well over the past couple of weeks. They were moved out from the front (noth-facing) bay window. While I don’t know if it was an issue with low light, the onions were dealt a major defeat. They have been put back under the ‘germination station’ with the lights. I expect it is due to ‘damping off’. 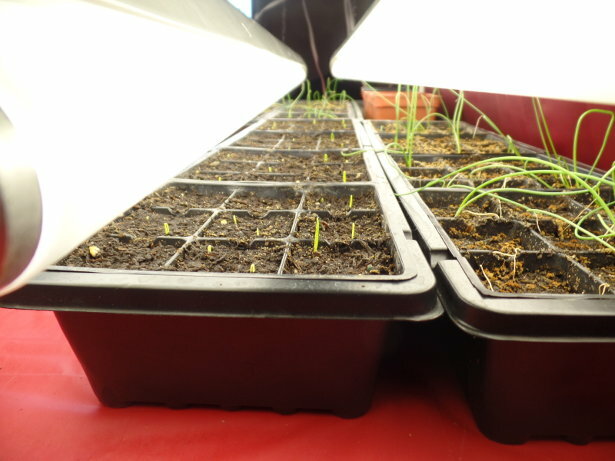 Every single cell had at least one – or two – onion seedlings growing very well. Then all of a sudden – I’m down to about 35 onions. All of the others fell over and withered. I had noticed that all over the top of the soil, there was a white substance. Looking it up online, I thought maybe it was mold or mildew growth. Instead, if was the damping off fungus. Damping off fungus is caused by too much moister and/or not enough air circulation. I’ve never done much with air circulation before – so now there appears to be yet another dimension to growing seedlings. Online, some people said to spray down the top of the soil with a 3% solution of hydrogen peroxide. Hydrogen peroxide already comes in a 3% solution at the store, so that seemed like an easy fix. Not sure yet whether or not that will help keep the damping off fungus at bay or not. At this point, it really is too late anyways. 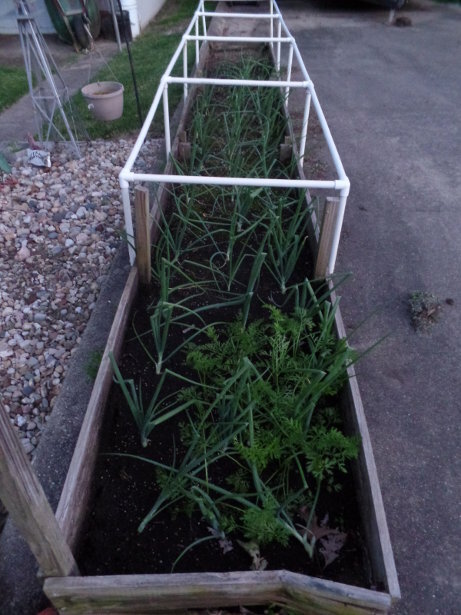 So, I planted another two containers of Walla Walla onions over the weekend to ‘start over’. 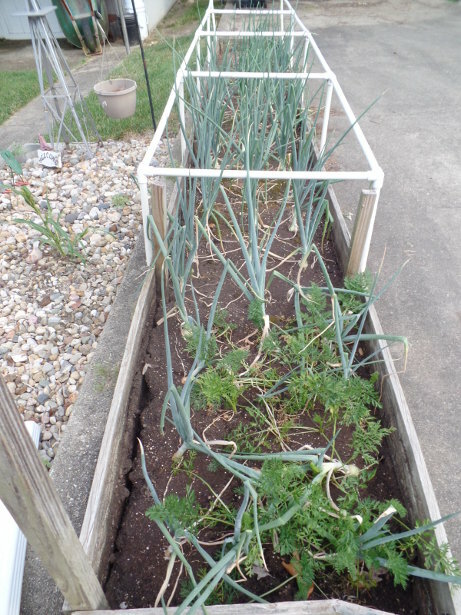 I’m still going to grow the onions that made it through – but 35 onions most likely will turn into 10 good onions in the garden. Just my luck with how well they grow – or at least from what success I had when using Copra or Red Bull onions in prior years. While I was planting again, I also decided to plant some Ventura celery. I attempted some celery last year – but they never made it. The seed I have is back from 2010 from FedCo seeds. So it is seven years old already! Hard to believe I have been gardening in the current house for that long of a period. So, now the germination station is starting to fill up. 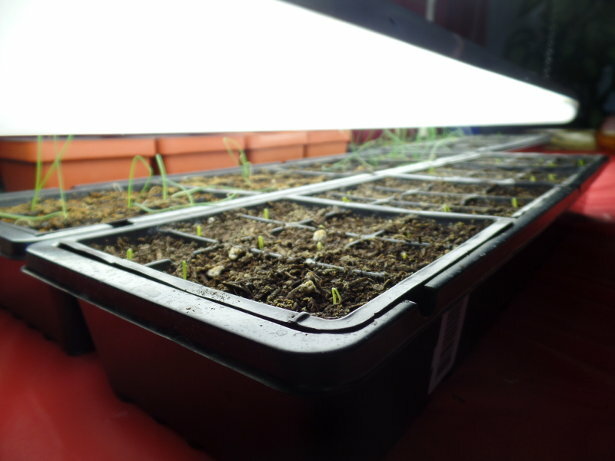 I still only have the one light though – no reason to get the other lights ready until I get germination out of the new Walla Walla onion seeds and the Ventura celery. See the little fan there in the bottom left? That is a small fan I got at Dollar General. Only consumes 2.5 watts of power, so very little. Problem is – I don’t want the fan running the entire time the lights are on – so that means having to get another timer to run that. My thinking is to let it run for maybe 15 minutes and then off for 30 minutes. Just enough to keep some air rotating every now and then. 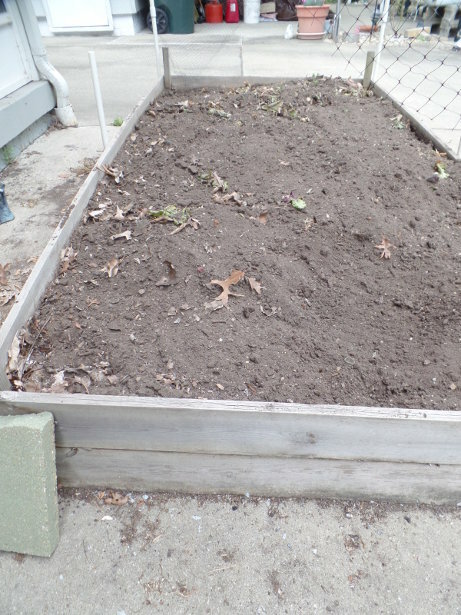 But I will have to really watch the soil and water as needed since it will dry the soil out. That is the idea for the top of the soil though – keep the moisture on top as low as possible but still allow moisture underneath. Great germination rates with the Walla Walla onion seed that was purchased! I haven’t done an actual count, but around 150 were planted. Two in each of planting spots (with six having three). 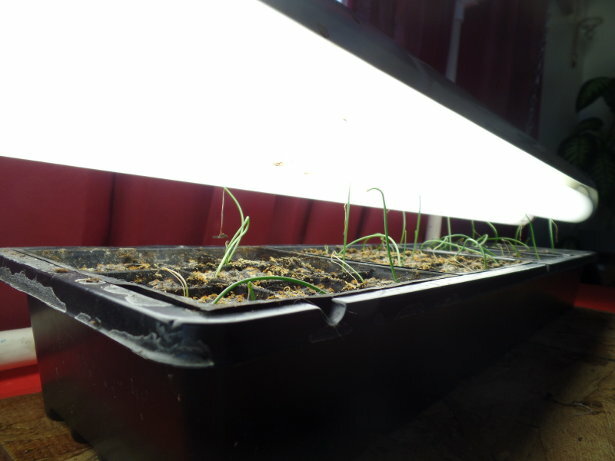 So far, it seems like putting the onion seedlings in the front bay window is doing OK, although they are stretching a bit towards the window. If I can save on energy costs, I’ll take it! We will see what they look like a week from now. 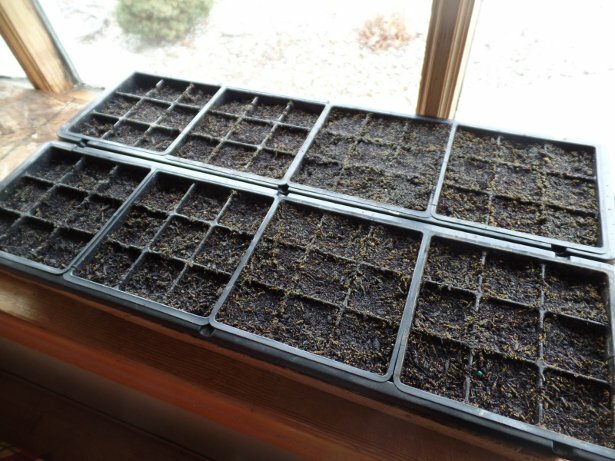 I am getting an earlier start on the garden this year. Yes, yes, I know. You might be asking why I am having a garden after the defeat last year (if you read prior posts). Well, gardening is my hobby. Even my wife this morning (while taking the pictures) said she didn’t know why I still do it. Each year always brings new challenges and new discoveries. While I know the front garden gets trampled by deer every year, maybe I need to use better fencing. I’ve used the green four-foot high ‘snow fence’ two years ago. Last year, I used the seven-foot high ‘deer netting’. Deer got in each time. With the deer netting, they couldn’t jump over it (at least I don’t think so), but the netting was so light and thin that it was cut in several places. Menards has a six-foot high wire fencing that I may try this year. Really want to get back to having tomatoes and green beans. 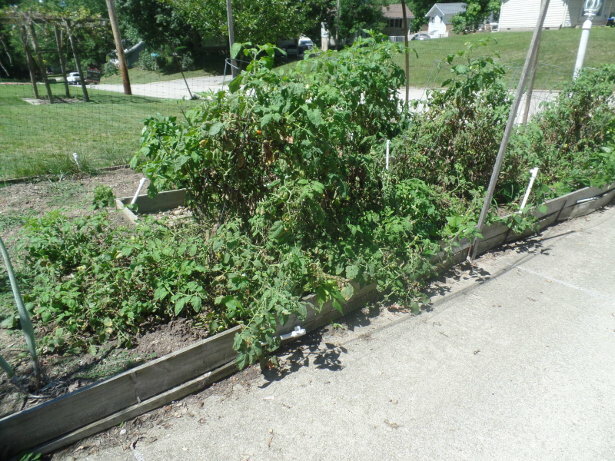 In years past, we got several gallon bags of tomatoes and green beans. Just this past week, I used the last bag of tomatoes, green beans, and finely chopped onions from the garden (yep, I will eat stuff 2+ years old). I made a big pot of a vegetable soup with corn, green beans, tomatoes, chopped onions, rice, a package of bacon, and some older mini hot dogs. Also had some cut-up peppers that were from this past year’s garden. I’ve been eating on it for a week and still have half a pot left – so it has lasted a long time! And it is healthy with all of the vegetables in it. Well, starting off this year earlier than before, I have already planted the onions. I’ve usually purchased seed from Fedco Seeds through mail order/online. But this year, the only thing I needed was onion seed. With their shipping and processing costs, I could not see paying $10+ for one packet of seed (which was about $2.60). On top of that, they have discontinued the onion I have always planted – Copra Onions. Copra had some of the best storage life and got fairly large. I never had too much success with getting the 1+ pound bulbs but they did last a while. So this year, I purchased two packets of 150+ Walla Walla seed from eBay. I wasn’t sure how the germination was going to be, so that is why I purchased two packets. Still a good price at $3 including shipping. Walla Walla looks to be a very popular variety, although it doesn’t seem to have the storage life that Copra onion does. Either way, that just means more will be chopped up and put in the freezer for soups. They were planted last weekend. 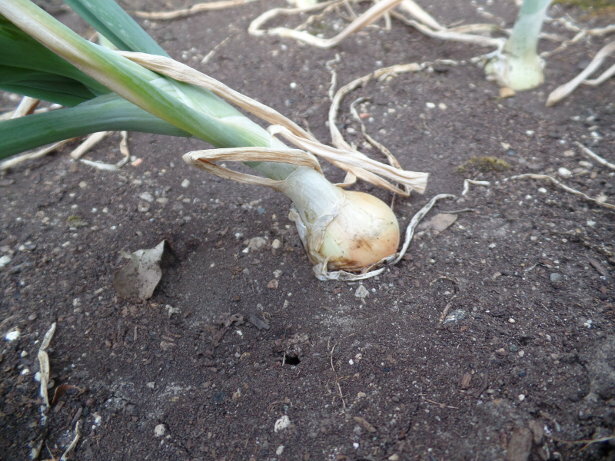 Seven days later (today), I have a total of six (of about 150 planted) Walla Walla onions just coming out of the soil. This year instead of using the larger planting containers, I used those that are half as wide. Same width. By doing so, I am trying something different – putting them in the window for light. We have a large bay window, although it is on the north side of the house. 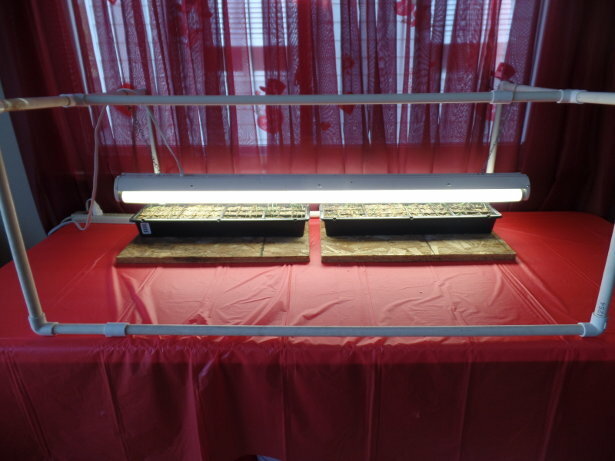 The “Germination Station” uses A LOT of power with all of the fluorescent lights. Each bulb is 40 watts and two bulbs per light is 80 watts. Then four light fixtures are used – so that burns 320 watts per hour. Adds up quick! 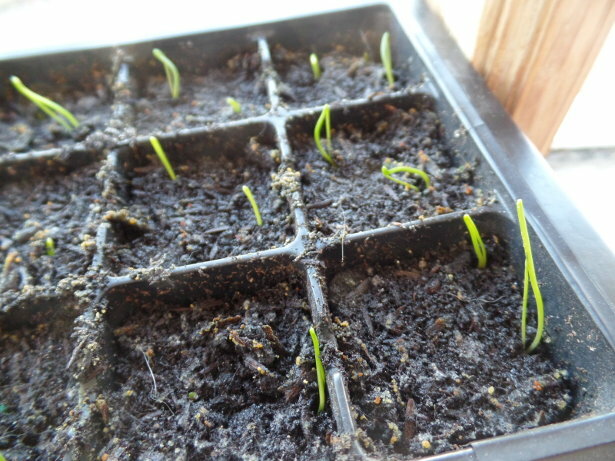 Since this year the onion seeds were started three weeks earlier than usual (typically has always been around the first of February), I am going to see how they do in the window. If it looks like they are not doing well, I’ll have no choice but to get the fluorescent lights set back up. Below is a picture of two of the small Walla Walla seedlings. That’s the update for now! The deer this year caused quite a defeat in the garden. Another bad year due to their feast. The apple tree also took a hit. The deer had pulled the tree so hard that it somehow twisted a branch and it had to be cut off. We had maybe a dozen apples on the tree but they all are gone. I am also wondering if the tree itself caused the apples to drop early – since there were some very high up and out of reach of the deer. Zero green beans this year. 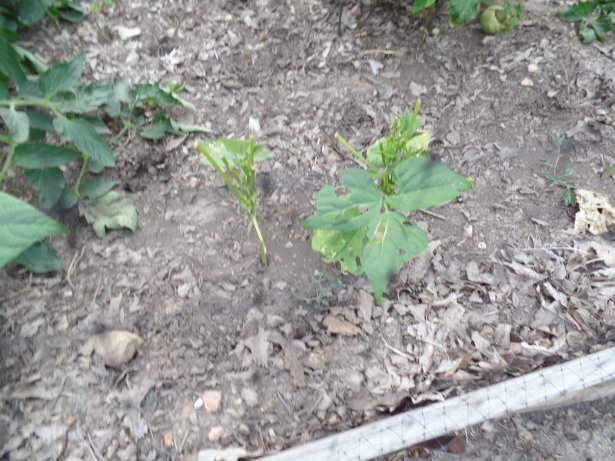 Green beans are planted down the four sides of the front garden and they were completely eaten up. 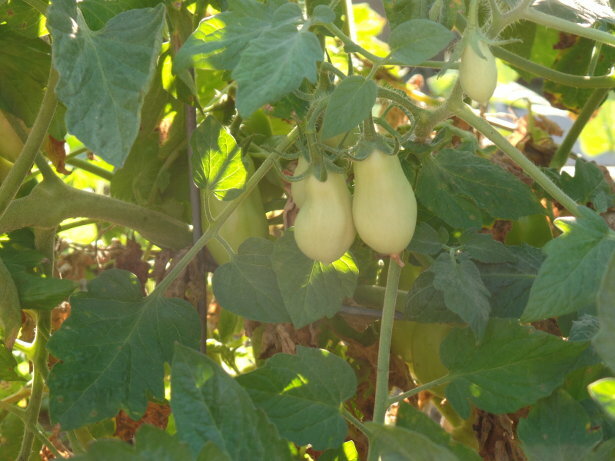 Tomatoes – sadly, maybe about six or seven collected. 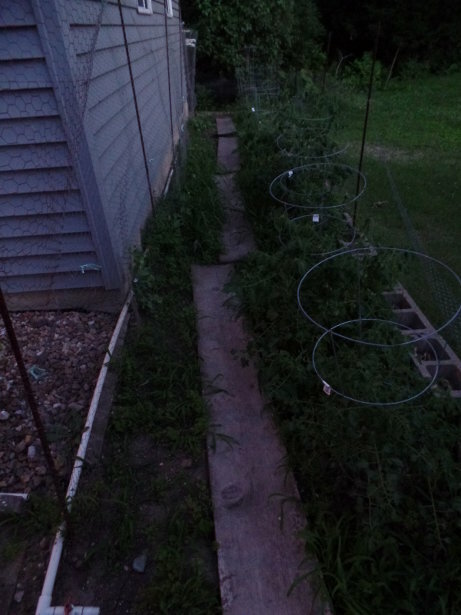 The deer stunted the tomatoes and prevented growth. While it was very hot this year during the summer, I am also thinking that fusarium wilt has set into the soil and caused some of the damage as well. Just a total waste with the tomatoes. Eight plants and almost nothing to show for it. Peppers – at least somewhat of a bright spot. The deer mostly stayed away from the peppers to allow us to get several pounds of peppers. But once I took down the deer netting when cleaning out the garden, watch out! 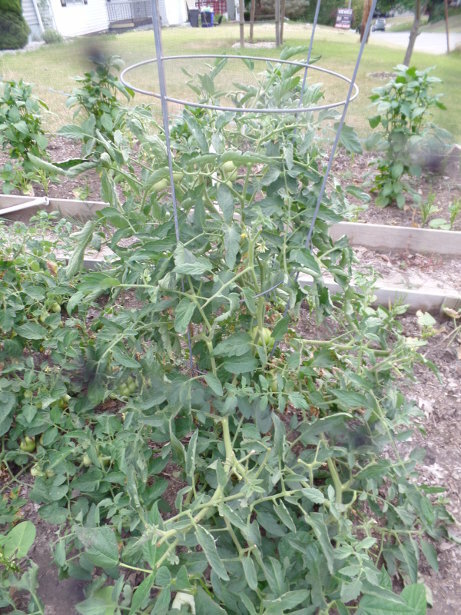 Within a matter of two days, the pepper plants were completely destroyed by the deer. Only the heavier stem sections were left. I always thought deer stayed away from peppers, but I know that is not the case. Well, the front garden is all cleaned up. I am just not sure what to do next year or if it is even worth it. Sure, we got some peppers and some onions – but everything else was eaten. At that rate, I could probably return half of the front garden to a lawn. I am attempting to put out a fall crop of lettuce. I planted probably 30 seeds of four different varieties of lettuce. The only two that came up – the Simpson Elite lettuce. Wow, another round of bad success. But hey, two is better than none! They were seeded probably a month ago. And plenty of weeds coming up too that need pulled. By the patio and driveway, there was a section of dirt. Long time ago, I planted watermelon on this area along with green beans and a few other things. But, it hasn’t been used for a few years now. So, a little bit of accomplishment here. 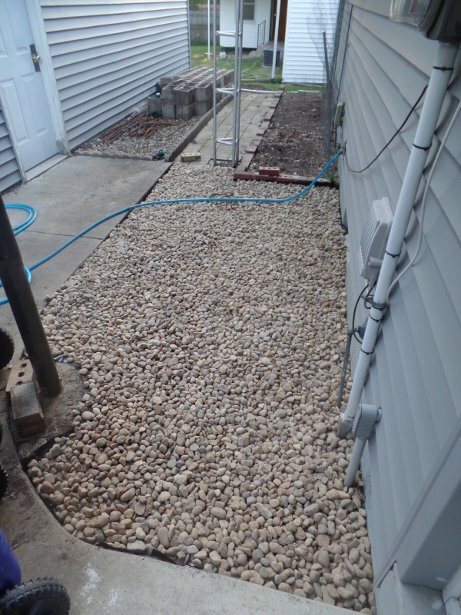 Tired of picking weeds, it was time to put down some black plastic and fill in with river rock. 18 bags of river rock later, it is done. No more need to pick weeds! Nothing fancy – although I did think about putting in a couple of shrubs. Decided against it though. 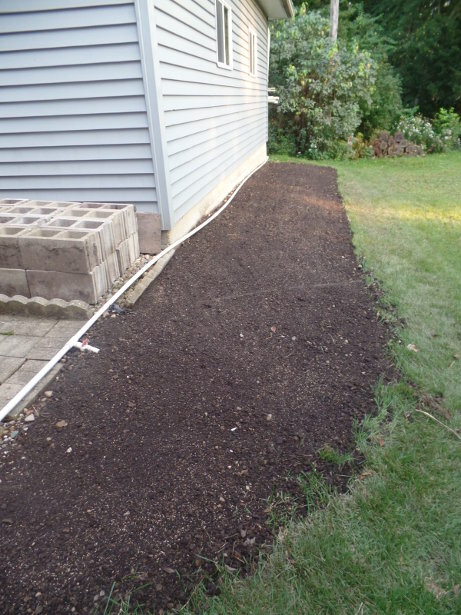 And the other accomplishment – which was a huge amount of work – returning the back garden to a grassy area. 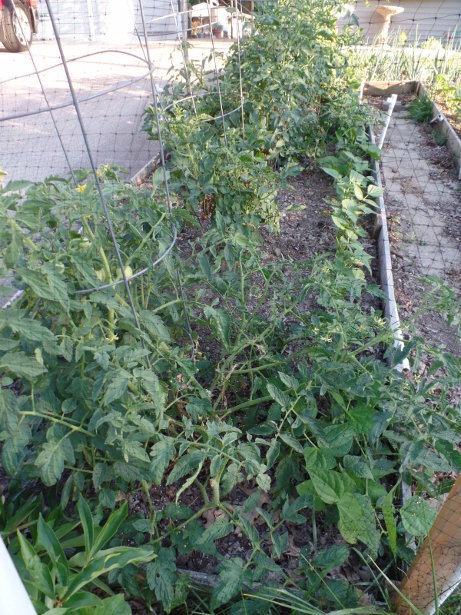 The back garden has certainly seen use over the years between peas, green beans, potatoes, onions, and tomatoes. But in the last few years, it has not been utilized nor has it grown very well. 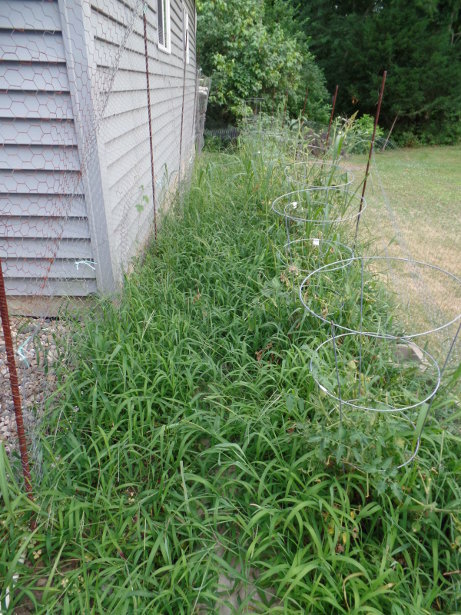 I’ve just let the weeds take over – and took over they did! 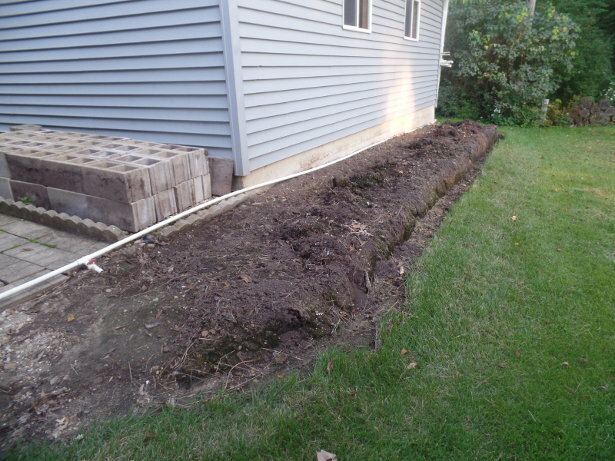 The cinder block retaining wall was all taken down a couple of weeks ago – leaving a lot of dirt to move. The area behind the garage sloped down towards the neighbors, but the cinder blocks kept it all level. So many years ago, a lot of dirt was used to fill and level out. In the picture above, you can see the cinder blocks against the garage – now to find a new home for them! And there is also the drop-off of the dirt. So this weekend, bright and early around 7:30, I got the tiller out and began to till the soil and haul away dirt. Luckily we have a small forest behind the house – so 20+ wheelbarrow loads later, everything was sloped well and grass seed was raked in. Looks quite a bit better. Now, I just hope that the grass will grow! I used a sun and shade mix that had fescue and Kentucky bluegrass varieties. It is mostly shaded since it is on the west side of the house – and with the forest to the south, it blocks the sun this time of year. Well, we will see what next year brings. I’m still on the edge about what to do with the front garden. 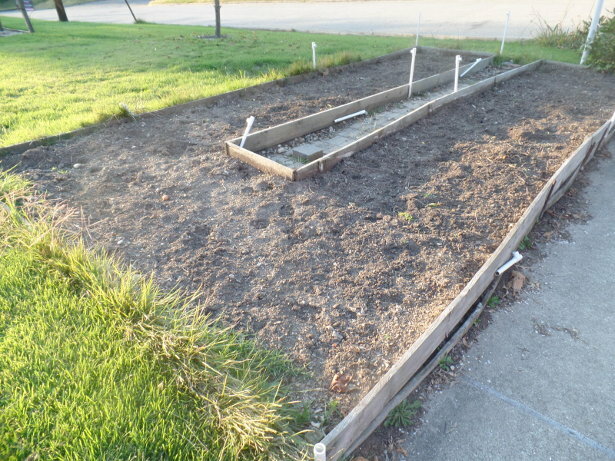 So much great space to grow veggies, but the deer and wildlife get to it before we can. Over a month has passed since the last post – July 11th was the last one. Between a family vacation and other things pulling me away, I haven’t done much gardening. There hasn’t been a lot going on either. In the last post, I detailed all of the potatoes being harvested. Since then, the onions were all harvested and we’ve had a few rounds of some peppers. I didn’t take pictures of the onions when they were picked, but they were picked and let to dry in the patio for three weeks or so. This weekend, all of the onions were cut up. It seems like there were at least 100 onions planted. In the end, probably about 40 total onions made it through. Many rotted out at the bottoms (which I’ve always had trouble with) and others died off or didn’t bulb. One thing is for certain though – most of the onions were much smaller than usual. I remember choosing the Copra onion variety specifically for the longevity of storage and the very large sizes that others had mentioned attaining. There were a couple of years where I had good success with having larger bulbs, but this year wasn’t one of them. 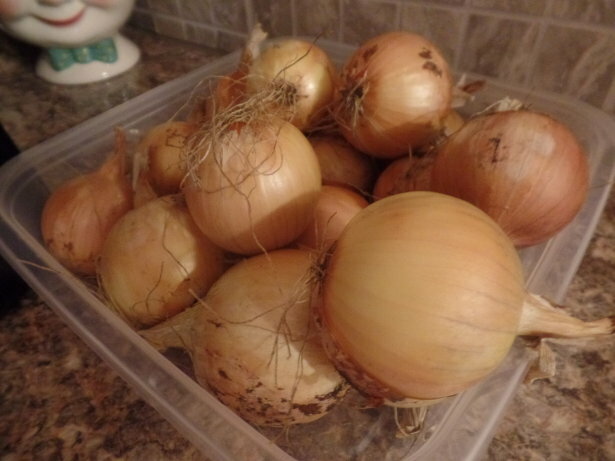 Anyways, about a dozen onions were left whole so we can store and use them over the coming months. We don’t use a lot of onions, but they are nice to put on salads. A couple of onions were also sliced to put in a crock pot chicken dinner coming up this week. 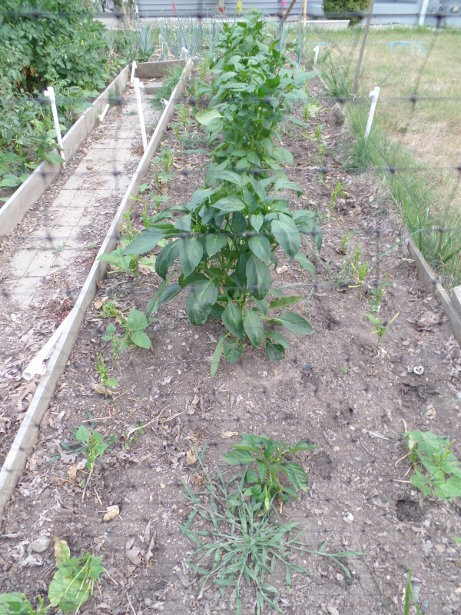 Next – peppers… lots of peppers. The seed that I saved some peppers we bought at Aldi are fantastic. They are juicy and sweet. Plentiful supply of them too. Prior to going on vacation, I picked a large bowl of peppers. My wife got them all cut up and put them in the freezer before we left as well. Upon coming back, the plants were covered with them again! 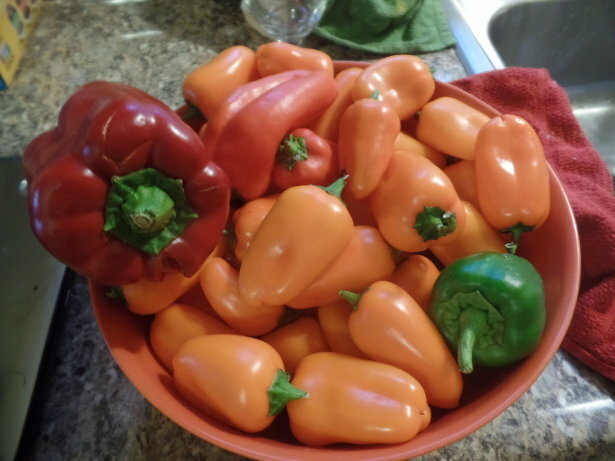 Here is our variety; we have two California Wonder pepper plants (the bell pepper type) and the smaller peppers are those that came from seed saved from the Aldi peppers. It has been a tough few years. Tomatoes were very poor last year and are poor again this year. 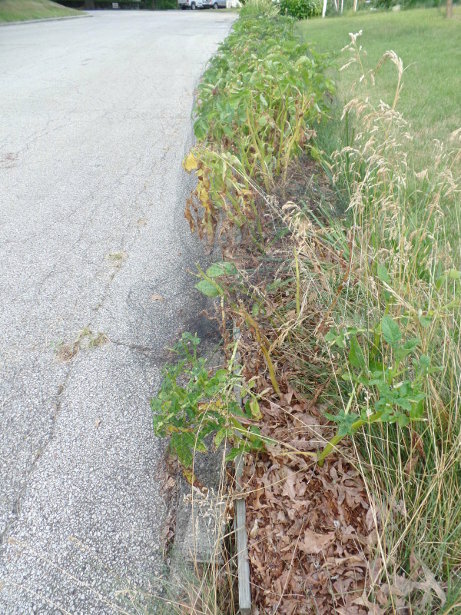 Last year, the deer caused destructive damage. This year, the same. They also leveled all of the green beans (although some do remain but no beans). Onions haven’t been great for a couple of years. Peas were poor. It is enough to make someone that has been gardening for years scale back – which is exactly what is happening. Just yesterday, it was a great day to get outside and do something. So, I decided it was time to dismantle the back garden. Boy did I have my work cut out! 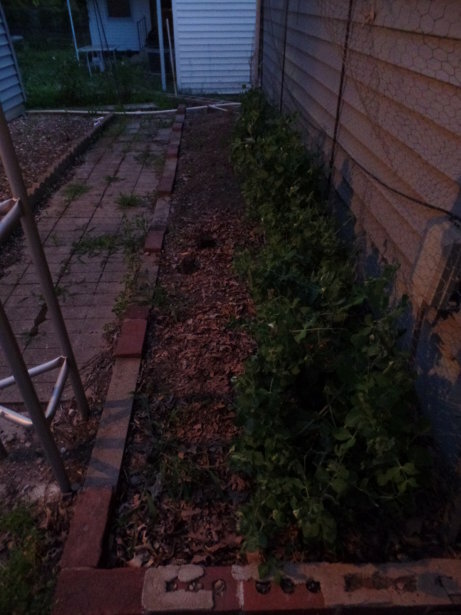 When I initially put this garden in, I made a trench to try and level out the first row of cinder blocks. Then there was one more layer of cinder blocks on top. Between the ‘holes’ in the cinder blocks, I drove rebar down a good 18 inches or more to keep the cinder blocks from moving. I also had the fence posts made of rebar that were drove down far. 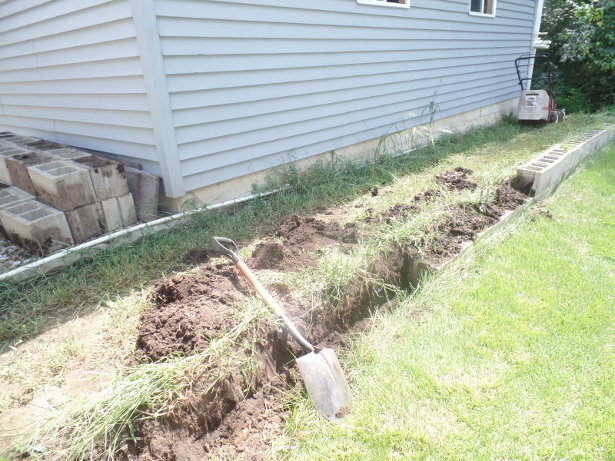 The hardest part of the situation – getting the rebar out! Getting rebar out of the ground was not a fun task. In the end, I was successful with finding a strategy for doing so. 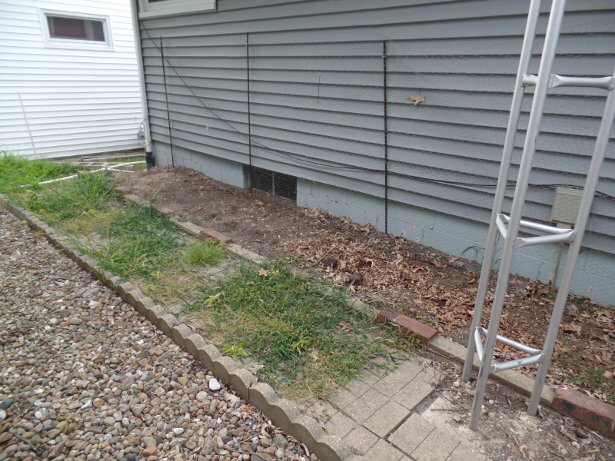 After I removed the two layers of cinder blocks, that exposed the rebar for a good 14 to 18 inches. I pulled the rebar towards me until the rebar bent. Then, I took the rebar and started to rotate it in a circle. By doing so, that caused the piece of rebar to loosen up and expanded the hole it was in. With a little bit of might, I was then able to pull the rebar out of the ground. I worked for 3-4 hours on Sunday and got about half of the wall removed. I’m out of shape since I haven’t done strenuous work in a long time, so I decided that doing half today was good enough for now. Why remove the back garden? Well, I’ve not had too much success with growing anything back here. It is on the west side of the house and the area only got five hours of sun or so each day. This isn’t enough to grow much of anything. 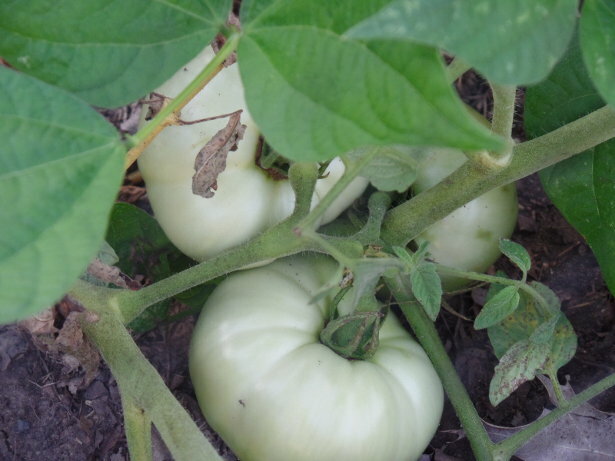 But, over the years, I have grown peas, cucumbers, potatoes, and tomatoes in this area – and even put onions in the ‘holes’ of the cinder blocks. But the past couple of years haven’t turned out well for the back garden – and then I just let it get overgrown with weeds. So it is time to turn it back into a grassy lawn. Finally, a couple more pictures. The grape vines are starting to die back. The birds have had their fill of the grapes so at least the wildlife are getting use out of them. And – at the beginning of the year, my wife and our daughter planted a few things in one of the garden beds on the driveway. Well, the carrots are still growing and look good! 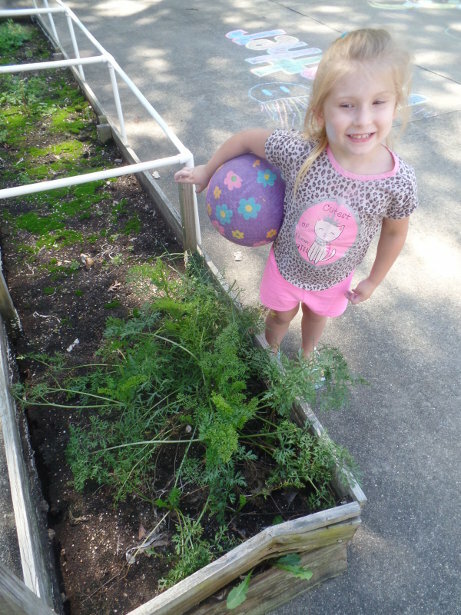 So I figured I would take a picture of the few carrots that were planted and a picture of our daughter smiling for the blog. In the last post, I mentioned that the lettuce was coming to an end. A bit late with this post, but the lettuce was all dug up last Saturday. I managed to get out in the morning – and the great golden digger wasps appeared to have either been in their nests or gone. Otherwise, we fast-forward to this weekend. This weekend, it was time to get the potatoes dug out. This year, they were harvested at least two weeks (or more) early! It isn’t ever a fun job to get all of the potatoes dug out – especially in the summer heat. After taking a short nap yesterday (Sunday), I saw that the sky was starting to cloud up a bit and knock out the sun. That made it better to get out and get the potatoes dug up. Took about two and a half hours. 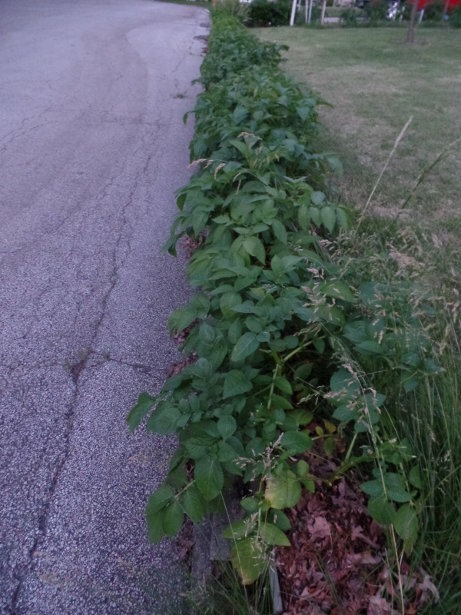 The potatoes are planted along the road – and it is a full row that spans the full length of our yard. It is maybe an area a foot wide by 50 feet long. 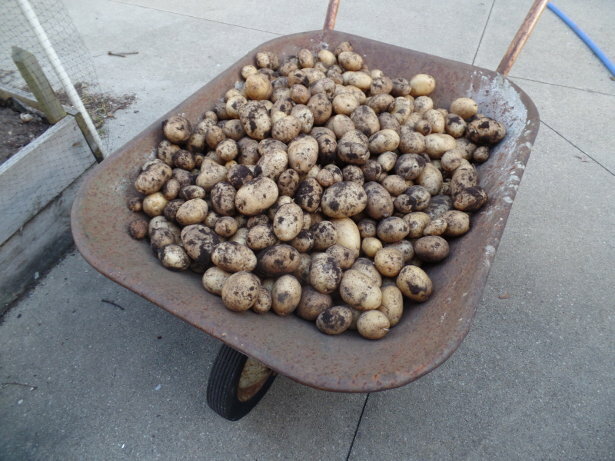 Got a wheelbarrow full of potatoes! Unfortunately since the potatoes ‘matured’ earlier, there were no large-sized ones. They were all small to medium-sized. Overall it was about two five-gallon buckets full of potatoes. 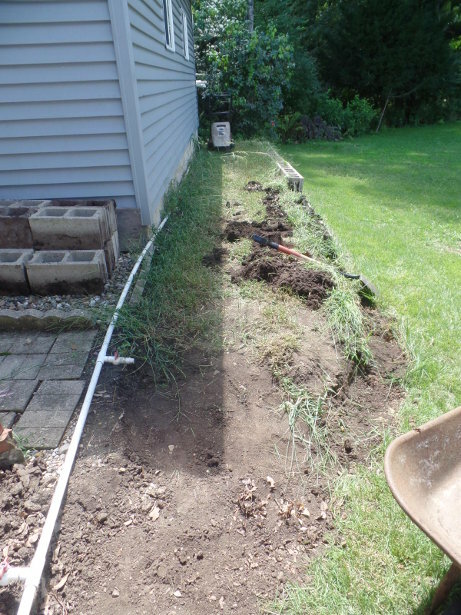 Now, the potato bed is all clean and ready for the next season – that is – if the Zoysia grass keeps out! 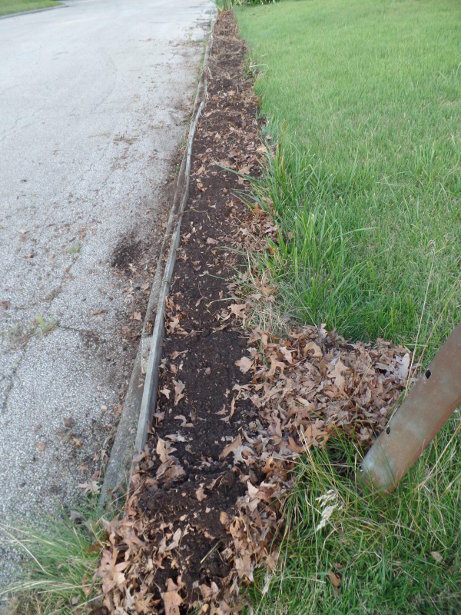 During the potato dig, I did my best to pull out the Zoysia runners that were invading the area. 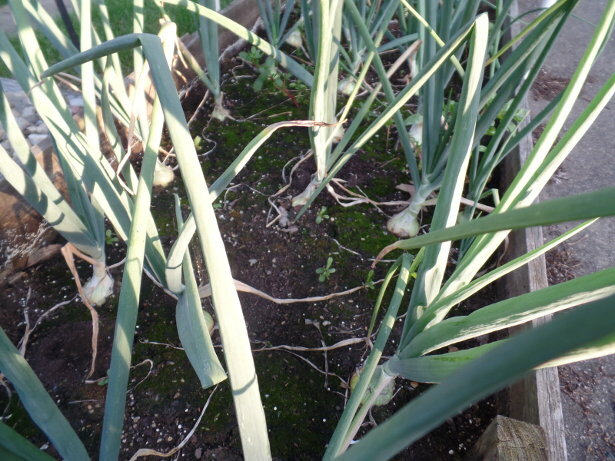 The onions are still growing – having to keep them watered. Many of the onions are not going to provide us anything, whereas we will at least get something from many others. A view of the front garden; it doesn’t look like much has changed. The Roma tomatoes are all very small. But, those plants have several on them too. Peppers are doing well. One of them got eaten by a deer or some other animal, but we have many peppers loaded on them! There are a few orange peppers that need picked, but most are still green and need to mature. Got several bell peppers growing as well. Another struggle of a year in the garden. Extra high temperatures caused the lettuce to bolt quicker this year. 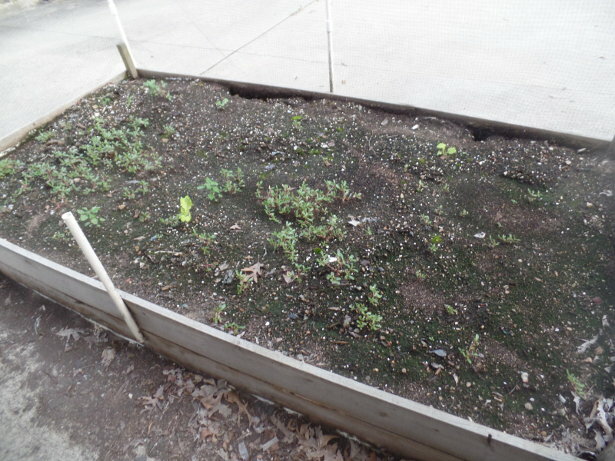 No more lettuce – unless I get a fall crop planted. You can see below that the lettuce is pretty tall and bolting. Why haven’t I pulled it yet? 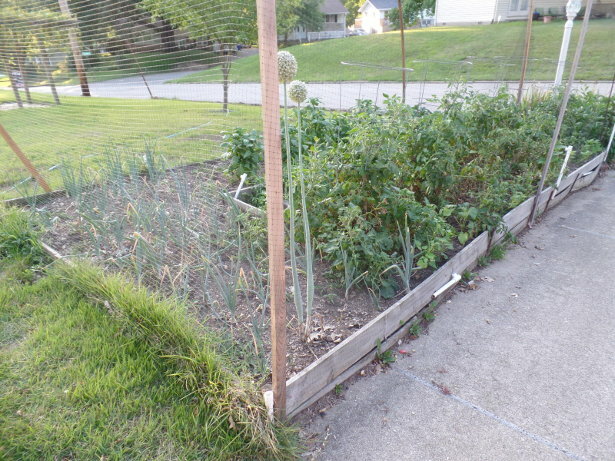 Well, you can see in the picture above – there are many little holes in the raised bed. We have a bad outbreak of wasps of some type. They are pretty long and have yellow-looking wings. 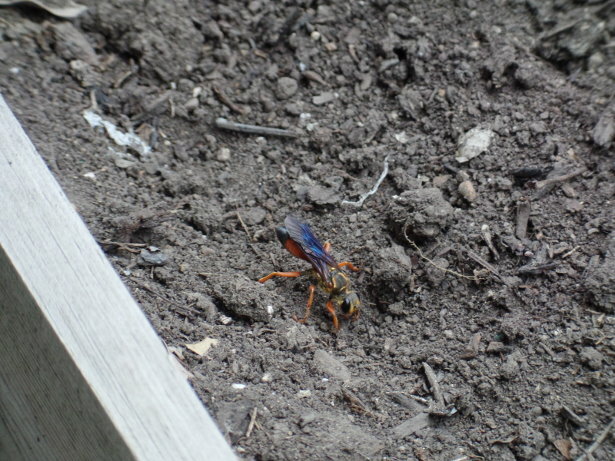 Looking online, the closest match I’ve seen is the Great Golden Digger Wasp. So, afraid of being stung dozens of times by all these insects, I’ve left the lettuce in for now. I did pull out all of the peas from the side garden – so it is clean now. But, there are also a few holes in this area too, so the wasps are making homes here. They first showed up last year – and now seem like they are really taking over. It is time to do something about it, but what? The back garden is a total loss. Not only is it weed-infested, the wildlife have damaged all of the tomato plants. They put their necks over the fence and just keep eating away. At least I think it is deer, but we do have some other creatures roaming around too. The back garden just needs to be fully taken down. 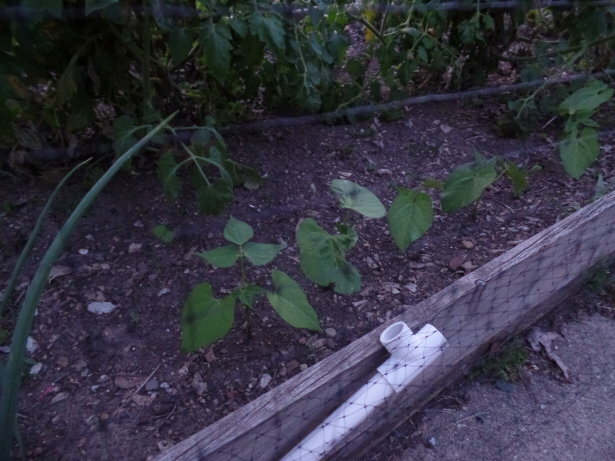 I really enjoyed it when we were able to get peas to grow back here – and some cucumbers. It was also used in the past for potatoes (last year I think) and a few others. In the driveway, the onions are continuing. They have been bulbing out for a couple of weeks now. Still, they are not even half the size I am hoping for. I can’t recall, but the onions usually are done bulbing in mid-July. Maybe that will give them enough time. And now for the front garden. It does seem things are growing well at first sight. Buuuttt… upon closer inspection of some plants, it is aggravating. I have had to put a couple more support posts up around the deer netting because something has been knocking some of the supports over. I still am not completely sure what is getting into the garden, but I still have to think it is deer. The large prints in the garden – and them being deep – indicate it has to be a fairly large, heavy creature. I also thought about raccoons (since one has been getting into our dumpster) or a beaver that was caught a few times munching on the peas and lettuce. Just not sure – but this year, the wildlife have won again. Last year I used green four-foot plastic snow fence around the garden. The deer just jumped right over it to eat everything down. This year, I used 7-foot deer netting. And somehow, they are still getting in. There are already several rips in the deer netting. But as you can see below, the green beans are pretty well eaten up. We at least had one row of green beans that were mostly untouched, but that changed yesterday when something else got in. And a tomato plant, although hard to see, it has been getting eaten at the top. Sure, I guess a raccoon or beaver might be able to stand up on the tomato cage and eat at the top, but I would think the bottoms of the plants would be eaten more. That is why I still believe it to be deer getting in somehow. Just as my wife said, she says I should just stop gardening because the wildlife are getting more benefit out of it than us. I guess we are getting onions and peppers – since the creature isn’t touching those (another sign of it being deer), but that tomato plants last year and the green beans last year were a total loss At least there are some green tomatoes on the vine this year that will hopefully ripen, but not as many as there would be – if the wildlife wasn’t eating it all. Speaking of peppers, the pepper plants are robust this year. With the extended heat we’ve had, they love it. I already have a couple of peppers turning orange and will be ready to be picked soon. You can see the green beans above too, just very saddening. See all the big prints in the soil too? How about the potatoes! I think the heat has caused some damage to the potatoes. The stalks seem to be dying back faster than they have in the past. Some have fully died back. Just cannot believe that they are ready to be harvested yet, since this is usually done mid-August. 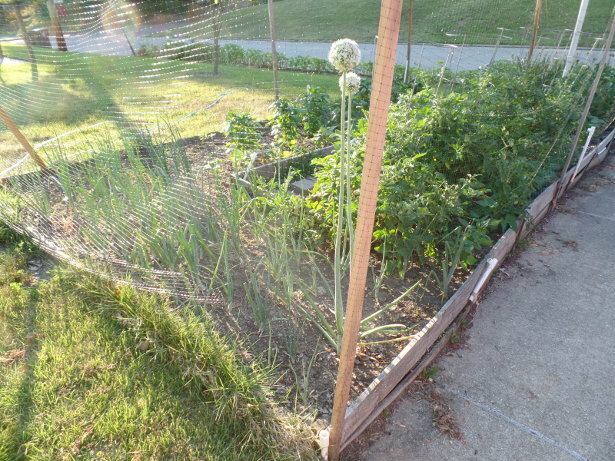 I also had to put deer netting over the potatoes – since something was also eating them too. 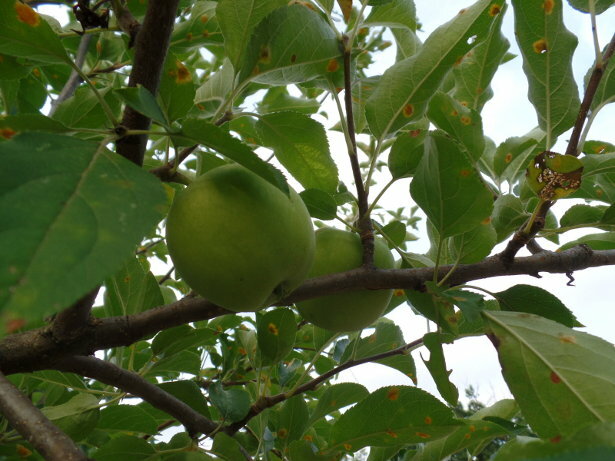 And the last stop for this post, the Granny Smith apple tree. There are a lot of small apples on the tree this year, so it looks like we will get a decent amount of apples for the first time! 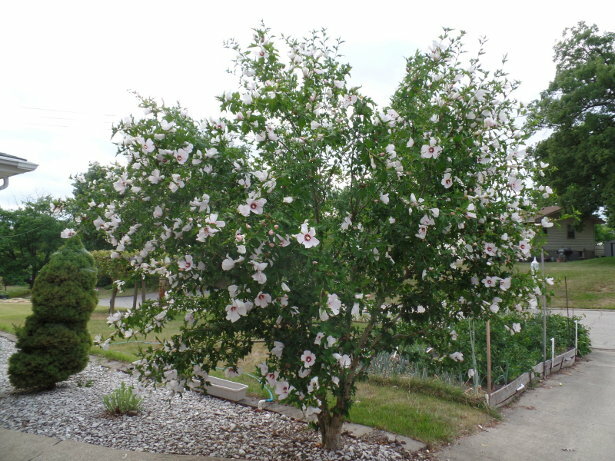 We planted the tree – probably five years ago – and the nursery said we would start to get apples within a year or two. Sure, whatever. We did get a couple last year – but they were very small and they were picked before being mature. This year, they are staying on the tree – just as long as it doesn’t weigh it down too much. Until next time, we will see what other chaos develops in the garden with the wildlife outsmarting me! Didn’t do much in the garden this weekend except kept it watered. It has been exceptionally hot in Central Illinois. Over the course of the past week, it has been in the 90’s – with maybe a day or two just shy of that. 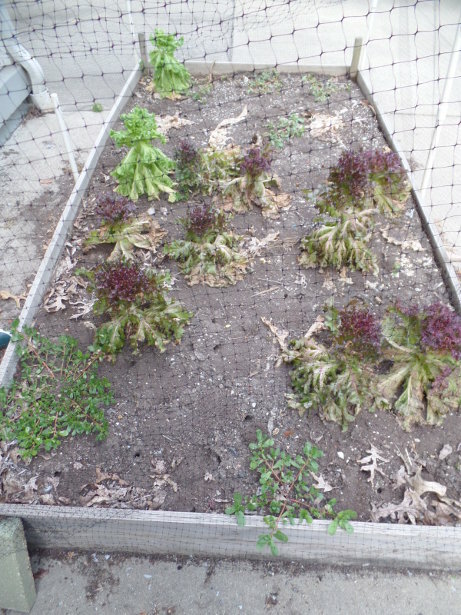 The garden and cool weather crops, like the lettuce, isn’t having any part of it. During the hot part of the day, the lettuce outside is droopy and looks sad. The lettuce has turned bitter unfortunately. Barely got two pickings of lettuce out of the garden this year. However, I found a post online that you can remedy bitter lettuce. The last batch (shown below) that was picked Sunday morning, I put it in ice water and put in some baking soda. It seems like it did help and some of the bitterness was taken away. After letting it sit in the baking soda and ice water for about an hour, everything was cleaned. Sat out to dry for a couple more hours and put in three gallon bags. We still have about two bags left from the prior harvest, so I ran up to the store to get a couple of onions, some mushrooms, more salad dressing, and olives. 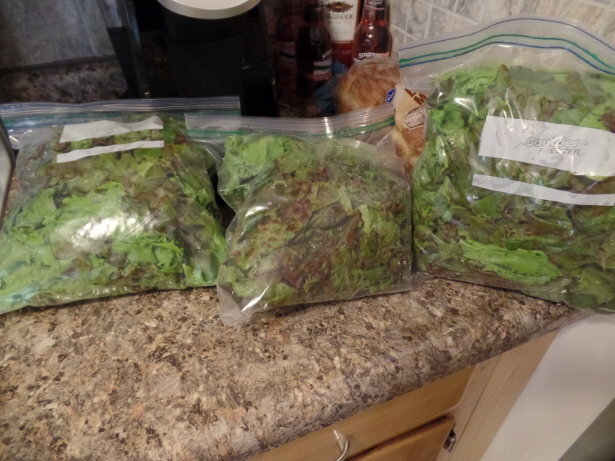 Going to have some big salads this week for dinner so we can enjoy fresh lettuce before it goes bad. Lettuce seems to stay OK in the fridge for about two weeks. 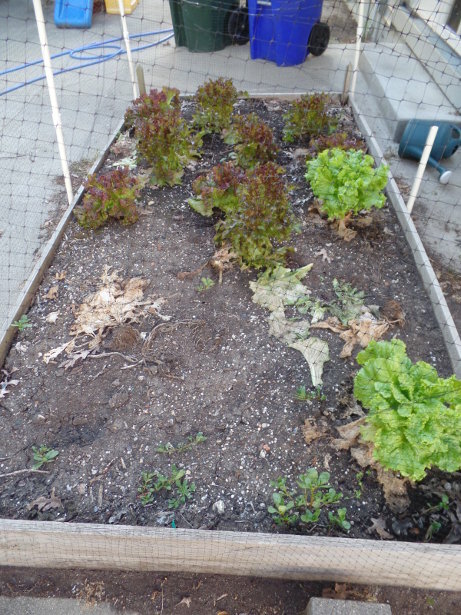 So, here is what the lettuce bed looks like now, that the plants had a hair cut. The Parris Island lettuce plants were already pulled out (couple dead spots in the photo above). Those really are plants that you pick the whole thing at the same time. And, the beaver (or whatever creature it was) already enjoyed those plants before we did. 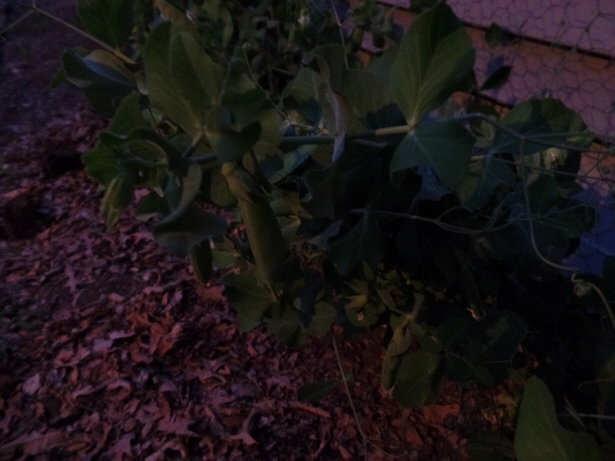 Peas – I got a small bowl of Cascadia Snap Peas – even though the creature certainly stunted the peas as well. 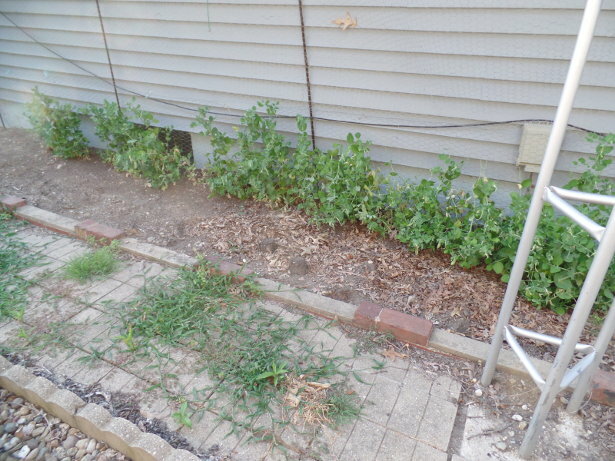 Usually, the peas go to the top of the chicken wire fencing, but they didn’t even get half-way up this year. So, at least I got a small bowl of peas though. Fresh snap peas out of the garden are fantastic on salads too. The back garden looks awful. 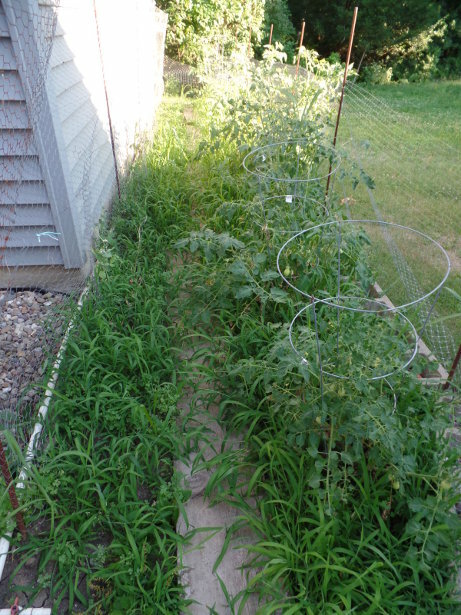 The tomatoes still are pushing through all of the weeds. Just lost my interest in the back garden with the overgrowth. And, only about a half dozen peas came up in the back. Back over on the driveway, the onions are beginning to bulb out now. The days must be long enough for that to happen. I had to buy some onions for the salads this week, but that should be the only ones needed until ours are ready to cut down. 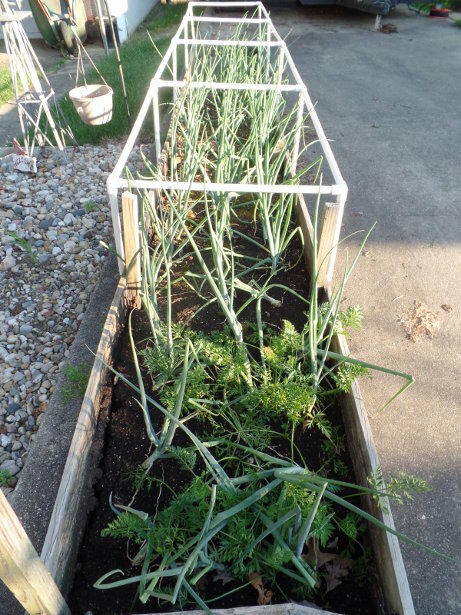 There are a few onions in the back of the garden bed that should be cut as green onions though – as they were planted too close together. Front garden – had a mis-hap this week. Woke up mid-week and found one of the posts in the front knocked down (the one to the left of the picture below, not in the picture though). Upon closer inspection, large prints in the garden and a lot of the green beans had been chewed! What creature was it? The darn deer! Tell you what – I go to great lengths every year to try and protect the garden – but the deer always cause problems. I still don’t know how they got into the garden. The deer netting is seven feet high. Onions in the front garden are also bulbing. I have lost several onions in the front garden too. Just seems like they stop growing then shrivel up. A lot of the onions in the front garden are not nearly large enough either, so they just didn’t grow that well in the front this year. 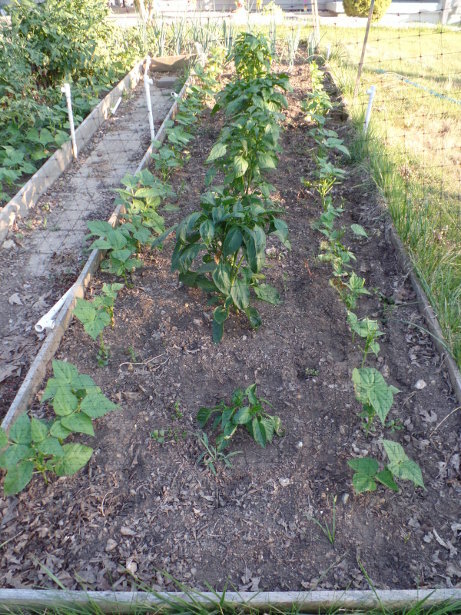 Down the pepper row, you can see that many of the green beans are still intact and are doing OK. Not all of them got chewed on, but some here and there are missing some leaves. The peppers – they are doing very well. They are loving this heat! 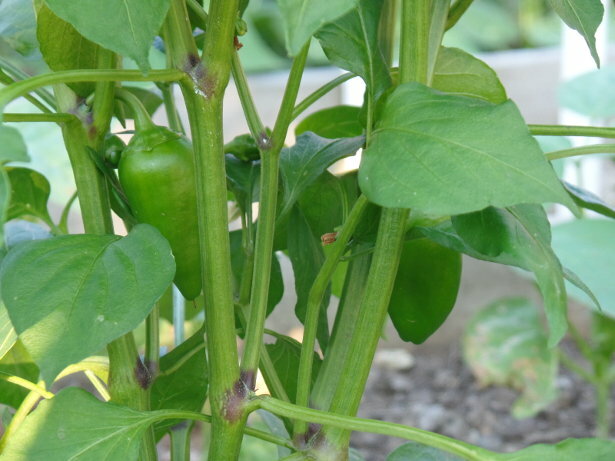 And a close-up look of a pepper plant – there are two small peppers starting already. Almost all of the pepper plants have flowers on them already as well. And down the tomato row, they are overgrowing the green beans! Potatoes – didn’t take a photo of them. Some of them are already turning yellow though – and the deer also gave several of them a haircut. But, deer may not like potato plants. I usually put netting over the top of them, but this year I didn’t. For the most part (even though shrubs and the front garden was eaten up), the potatoes only have a few nibbles on them. Another couple of weeks have passed since the last post. Last week, I had to take a trip down to Florida to do some work. But, I came back and the garden seems to be doing well. Apparently I forgot to take a picture of the lettuce – or I didn’t unload it off the camera. Anyways, our beaver buddy (or whatever creature it is) has stayed out of the lettuce – although he has now moved onto munching on the peas. The lettuce plants are all doing very well. Sort of a shame though; we have two heads of lettuce in the fridge and this abundance of fresh lettuce in the garden that has been unattended. I took all of these pictures a couple of nights ago – just before it got really dark. So the quality isn’t the greatest. Here are the row of peas. They are heavily stunted because of the creature making a feast of them. A closer look of some pea pods on the vines. I actually picked about four pea pods after taking the pictures for a nice, sweet treat. I picked a handful yesterday to put in last night’s salad too. The back garden is overgrown. A waste this year. 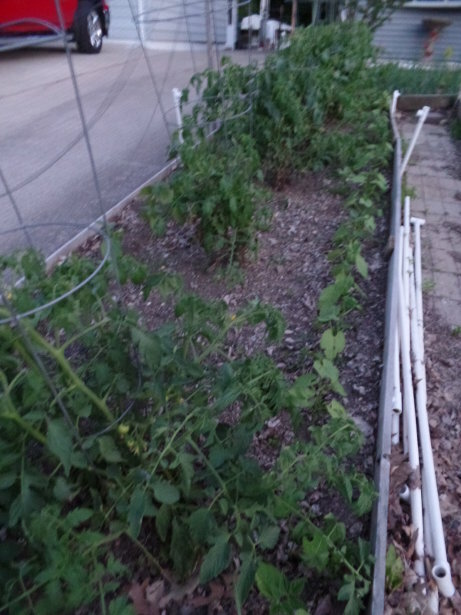 The tomato plants are doing OK, but there were only four or five pea plants that came up out of the 200+ seeded. I think that the garden behind the house is going to be converted back to it’s previous use; just a small slope towards the neighbor’s yard. Keeping this area up for the almost no output is aggravating. Hey, I have a lot of cinder blocks that will most likely be free for the taking by the end of the year! Going back to the driveway, the onions are doing quite well. This used to be the place where carrots were. 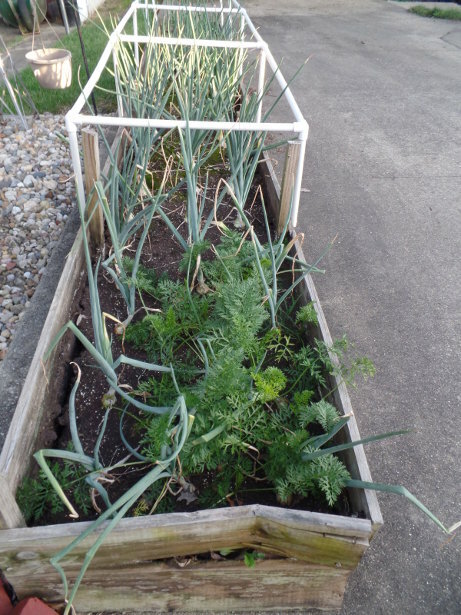 This raised bed sitting on the driveway was meticulously put together several years back – where all of the soil was sifted through a screen to ensure no big rocks or lumps – perfect for carrots. But, no carrots this year. Last year’s carrots were awful as well. The bed needs to have a bit of ‘topping off’ since it is a couple inches lower than where it used to be when new. But hey, the onions are loving it. 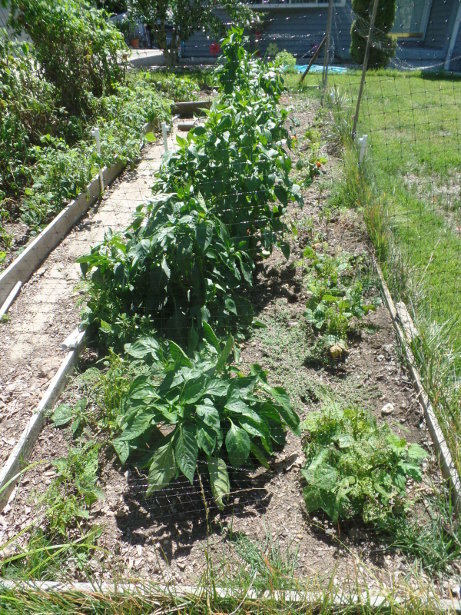 I just recently put a little bit of fertilizer around the onions, tomatoes, and peppers too. 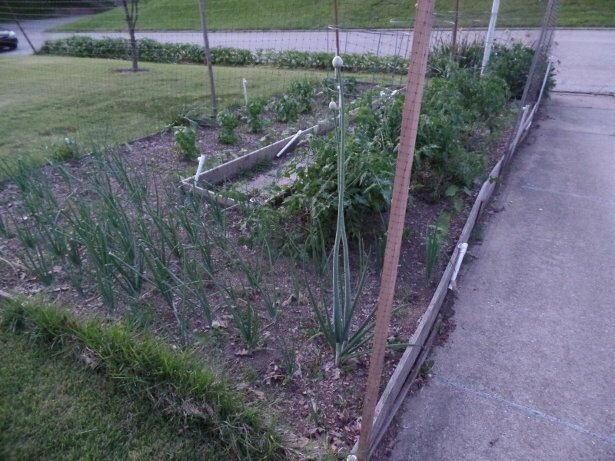 But the onions in this bed are doing better than those in the front garden. Oh, and there are a few carrots mixed in – as you probably spotted. Those were put in by our daughter. I guess she planted some carrots and peas in here before I put the onions in. Unfortunately, the peas had to be taken out, but I did leave some carrots for her to watch grow. Look at that tall onion! 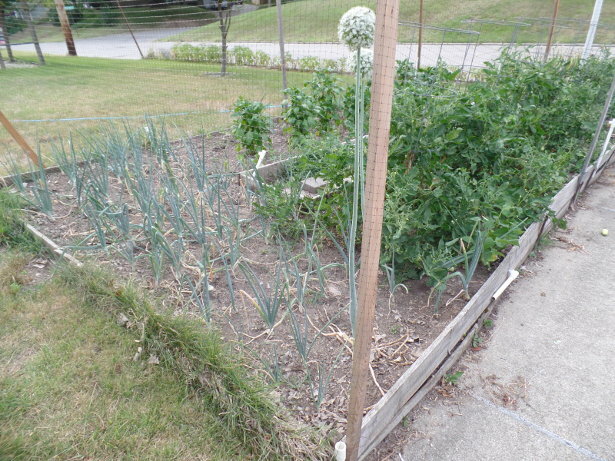 That was an onion that came up by itself this year – and now it has a large seed head on the top. I just have left it grow, but it really is useless. Can’t really use the seeds either. 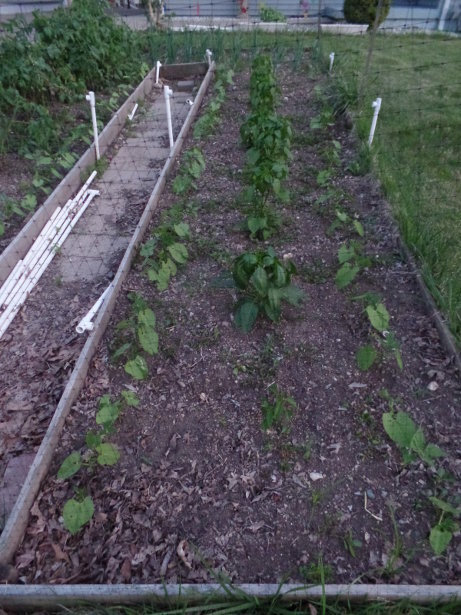 On either side of the beds, the green beans are coming up! 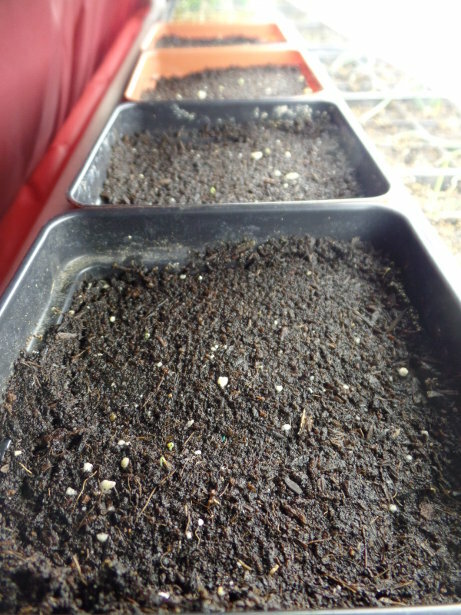 I seeded them a couple of days before I left for Florida, and I came back to see that they sprouted very well with great germination rates. The peppers are doing very well too. We are having a heat wave today through this weekend – supposed to get up to 97 degrees! Wow, and it is only the beginning of June. That kind of weather is usually reserved for mid July. And the tomatoes are doing good too. Pretty fuzzy picture though. But, look what we have here! 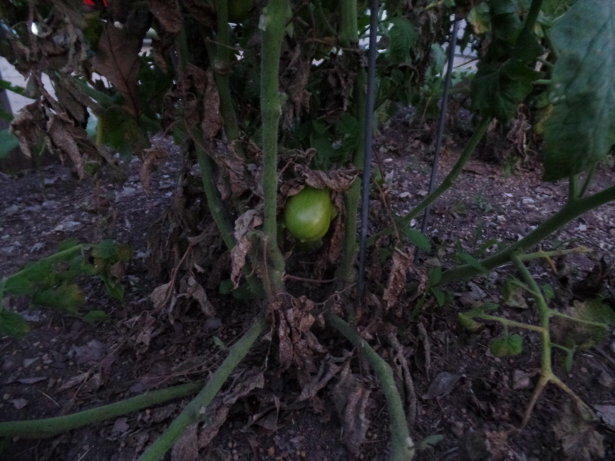 It looks like we already have our first Roma tomato growing on this tomato plant! Down by the road, we have the potatoes. They are all ‘mulched’ with leaves being put under the plants (also done before I left for Florida). It is kind of odd, because further down the hill, the potato plants are growing very well. Then as you come up the hill, the potato plants are smaller. Hard to tell from the picture, but maybe the water is going downhill and providing more moisture to those at the bottom of the hill. And we’ve come to the last picture. Just thought I’d share some grapes with you. 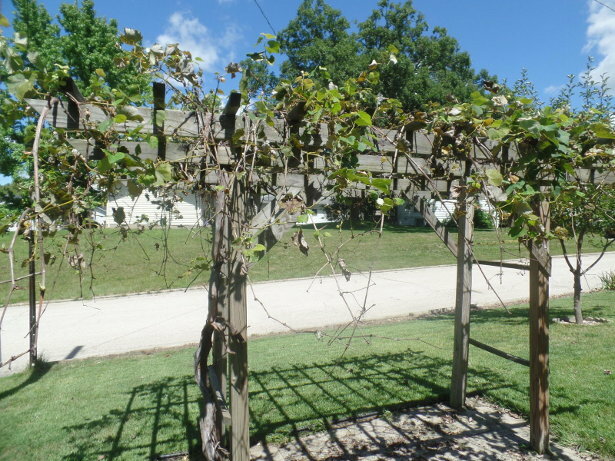 Our single grape vine left on the grape arbor has completely taken over. Woops, I didn’t cut it back this winter! 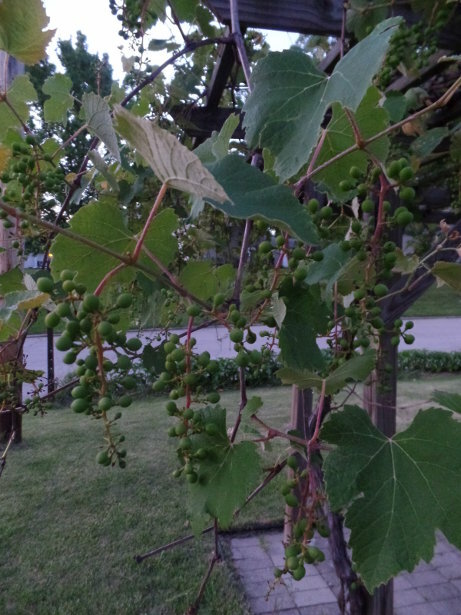 But, there are a lot of bunches of grapes!